Understanding the often violent protests that have brought the nation to a near standstill this year. 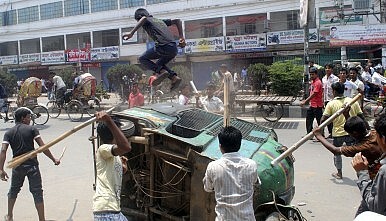 When Dhaka’s street battles began to intensify earlier this year, the ambulances started to pour out onto the streets. Going to pick up the dead and injured? In many cases, no. Instead, they were often used to shuttle expats, businessmen and rich kids to airports, offices and garment factories. For much of this turbulent year, Bangladesh’s capital has been devoured by hartals, relentless waves of violent general strikes that cripple the nation’s political, economic and social nerve center. Cars, buses even trains that defy the strikes have been attacked, torched and bombed (resulting in an impressive array of YouTube videos) – leaving only cycle rickshaws for the public and ambulance “taxis” for a privileged few as safe modes of transportation. Dhaka-based human rights group Odhikar claims 322 people have already been killed in political clashes this year, as a high-stakes general election looms. It’s the highest death toll outside a conflict zone, and higher than in many of those. On July 15, a war crimes tribunal convicted Ghulam Azam, the nation’s most prominent Islamist leader, of genocide and crimes against humanity committed during its war of independence. A 9-year-old girl was run over by a bus retreating from Islamists trying to torch it in the protests that followed. Now the courts have banned Jamaat-e-Islami, the country’s largest religious political party. Bangladesh is bracing for worse, with a fresh round of hartals on the cards. Originally a cornerstone of Mahatma Gandhi’s non-cooperation movement in India’s independence struggle, hartals used to enjoy the support of the masses, eager to join the cause. Businesses would stop doing business, public and private transport would cease transporting, workers wouldn’t show up for work. But more recently hartals have transformed into a wholesale replacement for democratic checks and balances in Bangladesh. Upset about inflation? Call a hartal. Think a court verdict is too lenient? Call a hartal. Think that same verdict is too severe? Why not call a competing hartal on the same day? Frustrated by the endless tide of hartals? Well, don’t let a sense of irony stop you. Opposition parties – and sometimes, bizarrely, even those on the government’s side – routinely take to the streets instead of debating in parliament. Armed cadres skirmish with security forces, and Dhaka’s residents are left confined to their homes. Midway through April, a particularly bad month, there had been only four working days in the capital. In the week that followed the Azam war crimes verdict, there was only one working day. The economic damage to one of the poorest countries in the world has been immense. Bangladesh’s garment industry, which can seem omnipotent in every other respect but appears powerless here, estimates the sector alone loses $25 million each hartal day. “Hartals affect people, garments, exports, agriculture, a whole range of people are affected by the hartals. But who cares? The government does not care, the opposition does not care. That’s how things stand, no one cares,” says CR Abrar, Odhikar’s president. Obviously public support for this mutant form of dissent has faded to non-existent. But the strikes have become more violent, more prolific. This owes much to the rise of the qedar, the street-fighting men of Dhaka. Mohammad Joynal Abedin holds your gaze. “I’ve seen a hell of a lot,” he likes to say, perhaps more often than he needs to, though he’s right. In 1971, at age 15, he picked up a sten gun to fight in Bangladesh’s liberation war. After the conflict ended, Abedin was a man without a job in a country without opportunities. He became an “activist”/enforcer who provided presence and muscle in political rallies as well as financial, real estate and other disputes.